Moreau, O'Sullivan and Nilsson have been put on waivers for the purpose of a buyout. I have been saying it for weeks and the day is finally here. After they clear tomorrow at noon (? ), then the Oilers will proceed with a buyout for those three. 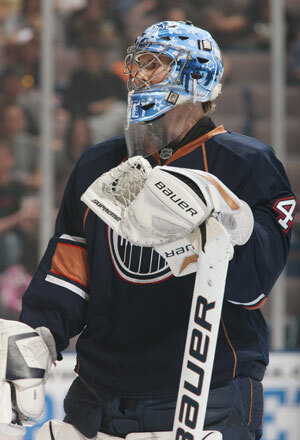 I personally thought that maybe the Oilers would retain Nilsson and they would keep him in OKC for the next season. That could still happen, but it's looking like buyouts is the only decision. What can I say? I have been on Team Hall right from the beginning. Even though that "Oil Change" documentary made me think twice about my decision; because let's face it, Tyler Seguin is gonna be one hell of a player too (thank goodness he's in the eastern conference...) But back to Hall. I am extremely excited for this upcoming season, I have never been this excited for an Oilers season in fact. It's gonna be great folks, we got Taylor Hall, Jordan Eberle, and Magnus Paajarvi all coming in next year. Let me also say I'm very happy with our draft selections this year, especially the Slovakian defenseman, Marincin, who we picked up in the 2nd round from the Riley Nash trade, he's going to be good, I'm telling you. Side note on Riley Nash, this trade had to be done, he should have been in the AHL by now but he wants to keep playing college hockey. Also, the Oilers continued their yearly tradition of drafting a goalie, Tyler Bunz, and from what I've heard, that was a steal. On Tyler Pitlick, not a steal here folks, this was the only pick I was a little confused with due to the opportunity to draft John McFarland or shut down defenseman Alex Petrovic at the time. But hey, we will see. Upcoming July 1st note: the Oilers MUST sign a hard-nosed veteran who can really play. Either a d-man or a center like Manny Malhotra. ALSO: I cannot stress how much deadweight we need to lose, like our new "Tambellini's To-Do List" says. The Oilers select (F) Taylor Hall with the 1st overall pick. The Oilers select (C) Tyler Pitlick with the 31st overall pick. The Oilers (from Carolina for Riley Nash) selects (D)Martin Marincin with the 46th overall pick. The Oilers select (LW) Curtis Hamilton with the 48th overall pick. The Oilers select (C) Ryan Martindale with the 61st overall pick. The Oilers select (D) Jeremie Blain with the 91st overall pick. The Oilers select (G) Tyler Bunz with the 121st overall pick. The Oilers select (D) Brandon Davidson with the 162nd overall pick. The Oilers select (LW) Drew Czerwonka with the 166th overall pick. The Oilers select (F) Kristians Pels with the 181st overall pick. The Oilers select (F) Kellen Jones with the 202nd overall pick. - The Oilers shipped Riley Nash to the Carolina Hurricanes for the (2nd round) 46th pick overall. - Oilers trade 6th round pick in 2011 to Toronto for the 202nd overall pick in this year's draft. Bob Stauffer talks with OKC Barons Owner, Bob Funk jr. Welcome to Day 2 of the 2010 NHL Entry Draft. Since I can't find any coverage on the TV, I have set up a LIVE TweetCast so we can all follow along. I have the feeling that the Oilers will make a splash today so at least this way, we get to see what happens. This LIVE TweetCast brought to you by OilFieldHockey.com and Oilers Jambalaya. 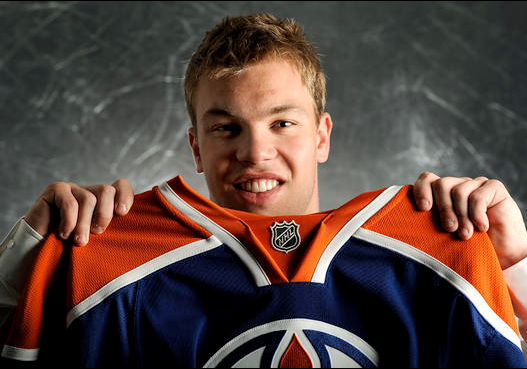 Welcome to the Edmonton Oilers Taylor Hall. It's going to be a fun ride watching you grow. Will the #4 ride again? 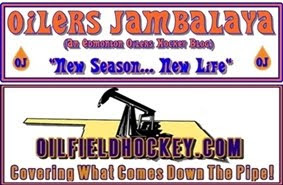 Welcome to the LIVE *TweetCast* brought to you by Oilers Jambalaya and OilFieldHockey.com. Kick back your feet and watch the tweets of OilFieldHockey, OilersJambalaya, AHLBarons, NHL, NHL_Oilers, DanTencer, Oilers_Travels, DarrenDreger, JasonGregor & OKCBaronsHockey. This should be a good time so don't miss out. We will find out if it's Taylor or Tyler. Finally. If you are on Twitter, give us a shout. If not, join and then you can give us a shout. Today -- which started out as boring and lame -- turned out to be really exciting for all the fans of Edmonton Oilers. First it started out with a Bruins/Panthers trade which to me, means that the Oilers will be taking Taylor Hall. With acquiring Nathan Horton and parting ways with the #15 pick, any hope of getting that pick is out the window (that's what I was hoping for). Back to Hall. It's also quite clear now that the Bruins have picked up a good solid winger in Horton, they seem to be preparing for drafting a center. And that's not Taylor Hall. Maybe I am wrong here, but I get the feeling the Oilers will take Hall. Then I'm told that Steve Tambellini is going to have a press conference at noon. I figured I'd look around to see what it's about and I came across an article by the Edmonton Journal that was saying basically that Tambo was just going to talk about heading to the draft today and what the Oilers have planned for the future. So like a moron I'm telling people it's no big deal. No huge news today. BAM! Pat Quinn has stepped down as head coach of the Oilers and Tom Renney is now the coach of the Oilers. So much for no news. I really didn't mind Pat Quinn as coach and I figured he'd be back next season. Quinn just had some really bad things happen to this team this year and I didn't really blame him for the failure. I did however blame him for a few other things he did but I won't get into it again. Thanks for your great quotes Pat. I'm going to miss you. Listening to Pat Quinn ( http://oilers.nhl.com/club/podcastplayer.htm?pid=98&iid=23047 ) talk about the situation he made it clear that he was not happy about not returning as coach next season. He went on to say that he was looking forward to coaching two 19 year olds that he has coached before. Who's that you ask? Well one guy is Jordan Eberle. The other? My money is on Taylor Hall. There is no other kid in the Oilers system that Quinn has coached before other than those two. So if it's NOT Hall, who is it? The next big shocker for me was opening the mail today. Our friend Scott from OilFieldHockey.com sent me a puck from the OKC Barons name reveal. How cool is that? Thanks Scott for this, it's going to be great to add to the collection. Is this the first Barons merchandise in Alberta? Maybe... but I doubt it. Here is a audio link for the new Oil Change documentary preview if you still need something more to do. I was super bored today and I had a lot of time to let my mind wander. I started to think about what my all time Edmonton Oilers team would look like and I kind of got excited. All the line combos a person can work out is crazy. There is just so many options. So I figured I would do a post on who I would choose for my all time Oilers team. Past and Present. Does my team/lines look like yours would? Probably not right? Feel free to post yours below. The Oklahoma City Barons have reached an agreement with Clear Channel Communications to broadcast the games on 96.1 FM KXY. The 3 year agreement includes that the games will be broadcast on the Internet from KXY.com. No word on who the voice of the Barons will be for the broadcast. The Oilers announced that their prospects will partake in a Prospect Camp, that the Vancouver Canucks will be hosting in Penticton, British Columbia. The tournament will start on September 12, and go through September 16th.The Tournament Camp will feature the top prospects from the Oilers organization, and 4 other NHL teams. The Tournament will feature a round-robin style format during a five day period. The Oilers' prospects will play on Sept 12th at 6pm(CDT), Sept 14th and 15th at 9:30pm(CDT). The Tournament will be broadcast live on the internet from oilers.nhl.com.Oilfieldhockey.com and Oilers Jambalaya will be hosting a live tweetcast for the entire week of the tournament. The tweetcast will feature tweets from the Edmonton Oilers, Oilers Jambalaya, Oilfieldhockey.com, and many more. STOCKTON, Calif. - The Stockton Thunder, a two-time recipient of the ECHL "Award of Excellence," announced that the Thunder organization has been named recipient of the 2010 ECHL Ticket Department of the Year award at the recent league-wide meetings held in Las Vegas. "Winning this award for the second time in our five seasons is a true testament to the hard work of our entire staff," said Thunder president Dan Chapman. "In difficult economic times you have to be creative and thorough in your efforts to attract more fans and our staff has done a great job in that regard. We're also so very fortunate to have such a dedicated fan base that supports Thunder hockey throughout Northern California." The award marks the second honor for the Thunder, who was co-recipient of the award in 2006. The Thunder ticket sales department is led by vice president of sales Dave Piecuch and comprised of director of group sales Alex Geche and account executives Vince Munguia, Clint Eastman, Michael Koebler, Robert Norton and Alex Wheatley. Thunder account executive Vince Munguia, delivering season tickets to awaiting Thunder fans at "FanFest", was part of the organization's second ECHL Ticket Department of the Year honoree. The Thunder, a four-time leader in ECHL attendance, averaged over 6,000 fans per game at Stockton Arena and drew over 200,000 fans at the gate last season for the fifth straight year. Welcoming its one millionth fan through the turnstiles last season, the Thunder has drawn 14 sellouts in franchise history and had five crowds of 8,000 fans or more in 2009-10. Enjoying a season which included advancement to the National Conference Final for the first time in Thunder history, the team went 17-12-7 at home and 16-6-4 in the last 26 home games. "Thunder Goes Pink IV," presented by St. Joseph's Medical Center in association with Food-4-Less/Rancho San Miguel Markets and Antonini Freight Express, once again proved to be a definitive success, where 16,368 fans through two games on Nov. 6-7 helped raise $32,480 in cash, split evenly between the event beneficiaries: American Cancer Society - Stockton Field Office and St. Joseph's Foundation - Breast Cancer Services. This year, the Stockton Thunder continued its growing "Easy Being Green" Campaign, with a "green weekend" on March 5-6 in two games against Victoria. The two-day event, which drew over 13,500 fans, featured a pre-game "Green Fair" (before each game) featuring local eco-friendly businesses and organizations distributing information and green-themed giveaways. In front of a sold out crowd of 9,737 on Jan. 30 against Victoria, the Thunder was able to collect a record 4,348 bears and other stuffed animals on "Teddy Bear Toss" night to donate to the United Way who in turn distributed them to local children's charities. The Thunder are freezing Season Ticket prices for the 2010-11 season, which are on sale now and can be purchased by calling (209) 373-1500 or by visiting www.stocktonthunder.com. Thunder Season Ticket Holders enjoy the highest-demanded seating locations in Stockton Arena, preferred parking options, benefits including admission to Season Ticket Holder-only events, discount opportunities on Thunder merchandise, a free e-newsletter, an exclusive gift, admission to the first two rounds of the Kelly Cup Playoffs and more. Information on individual tickets and mini-plans will be announced soon. 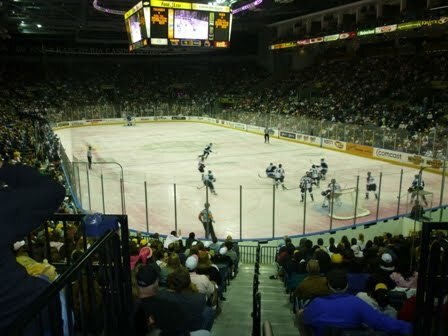 The proud ECHL affiliate of the Edmonton Oilers of the National Hockey League, the Thunder was voted "Best Local Sports Team" by readers of the San Joaquin Magazine, led the ECHL in attendance for four consecutive seasons and drew over 200,000 fans for the fifth consecutive season in 2009-10. Season tickets for 2010-11 are on sale now. For more information about tickets, merchandise, or other inquiries contact the Stockton Thunder offices at (209) 373-1500 or visit http://www.stocktonthunder.com/. 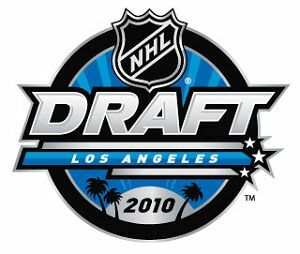 On Friday June 25, 2010 come join the LIVE TweetCast of the 2010 NHL Entry Draft brought to you by Oilers Jambalaya and OilFieldHockey.com. Catch all the action right here as we follow along the Edmonton Oilers and who they pick with their #1 overall selection. Taylor Hall or Tyler Seguin? We will find out on June 25th. Make sure you come back and join the fun. The Stockton Thunder is an ECHL team that has an affiliation (*not yet confirmed for this upcoming season*) with both the Edmonton Oilers (NHL), and the Oklahoma City Barons (AHL) Here is why the Thunder are glad for their affiliations. The Edmonton Oilers, one of the most storied teams in hockey history, extended its affiliation agreement with the Stockton Thunder in the summer of 2009 after the Thunder advanced to the Kelly Cup Playoffs for the third consecutive season, increased a total of four alum that have advanced onto the NHL and produced eight ECHL All-Star selections in three seasons. For the fifth (**not yet confirmed**) consecutive season, Stockton will serve as the AA minor-league affiliate for Oilers prospects. Since the Thunder and Oilers began their partnership in 2006-07, the Thunder has advanced to the Kelly Cup Playoffs (edit) four* consecutive years and four former Thunder players - right wing Troy Bodie, center Tim Sestito, left wing Liam Reddox and defenseman Bryan Young - have gone on to play in the NHL. Sestito made his NHL debut with the Oilers last season on Nov. 26 against the Los Angeles Kings. The 6-foot, 195-pound forward played in 66 games for the Thunder in 2006-07, ranking second on the club with 132 penalty minutes while scoring 26 points (13g-13a). 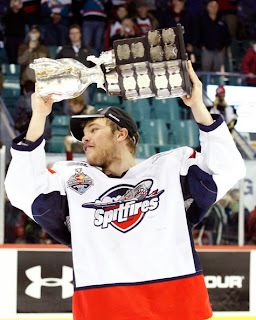 Sestito, who wore the "C" as captain for the Springfield Falcons of the AHL last year, helped guide the Thunder to the first Kelly Cup Playoff berth in team history during 2006-07 and scored three points (2g-1a) in six playoff games, ranking tied for second on the team in playoff scoring. Bodie debuted with the Anaheim Ducks on Jan. 16 against the Pittsburgh Penguins. The 6-foot-4, 219-pound forward was originally selected by the Oilers in the ninth round (278th overall) in the 2003 NHL Entry Draft and skated in 46 games for the Thunder in 2006-07, ranking second on the club with 21 goals while amassing 38 points (21g-17a) and 80 penalty minutes. Bodie added two assists in six Kelly Cup Playoff games and represented the Thunder in the 2007 ECHL All-Star Game in Boise, Idaho. In total, seven Thunder players, including two who have been selected in the first round of the NHL Entry Draft, have been named to play in the ECHL All-Star Game in the last three years while in the Oilers farm system. Goaltender Devan Dubnyk, a first-round selection of the Oilers (14th overall) in the 2004 NHL Entry Draft, set Thunder single-season records in 06-07 for wins (24), minutes played (2,529), lowest goals-against-average (2.56) and save percentage (.921). Dubnyk made a game-high tying 17 saves in the second period of the 2007 ECHL All-Star Game for the National Conference. Center Ryan O'Marra, who was selected in the first round (15th overall) by the New York Islanders in the 2005 draft and an Oilers trade acquisition in 2006-07, was originally named to the National Conference squad at the 2008 Chase Chevrolet ECHL All-Star Game shortly before earning a recall to Springfield of the American Hockey League. O'Marra scored 20 points (11g-9a) in 24 games with the Thunder last year and added nine points (2g-7a) in six Kelly Cup Playoff games. Last year, Thunder forwards Cory Urquhart and Ryan Huddy played under AHL contracts with Springfield and were named to the National Conference all-star team. Huddy, whose father Charlie previously was an assistant coach and was a member of five Stanley Cup champion teams with the Oilers as a defenseman, led the Thunder with a club record 73 points (35g-38a) and 35 goals in 69 games, ranking ninth overall and third in ECHL rookie scoring. Urquhart's 60 points (28g-32a) and 28 goals in 57 games paced second on the Thunder in both categories, adding a team-high tying five game-winning goals. His 16 points (10g-6a) and 10 goals in 14 postseason games broke Thunder playoff scoring records in both categories last season. The Oilers, a member of the NHL's Western Conference and Northwest Division, have been a member of the National Hockey League since the 1979-80 season. A winner of five Stanley Cup Championships (1983-84, 1984-85, 1986-87, 1987-88 and 1989-90), the Oilers became the NHL's first-ever eighth playoff seed in league history to advance to the Stanley Cup Finals in 2005-06 as the league's Western Conference Champion, falling in seven games to the Carolina Hurricanes in the Finals. Currently led by president of hockey operations Kevin Lowe and general manager Steve Tambellini, the Oilers have sent six players to the Hockey Hall of Fame - a list of "who's who" in hockey history - including Wayne Gretzky (NHL's all-time leading scorer), Jari Kurri, Mark Messier, Grant Fuhr, Paul Coffey and Glenn Anderson. Glen Sather (Head Coach/President and General Manager) and Rod Phillips (Radio Broadcaster) have also earned spots in the Hall of Fame. "We are pleased to once again extend our agreement for another year with Stockton. The Thunder organization have provided our players with a positive environment that enables them to develop as professionals. We look forward to another successful season with Stockton in 2009-10." "The Stockton Thunder are very excited about entering into our fourth year of an affiliation with the Edmonton Oilers. Developing young players and putting a winning team on the ice are the two most important factors when considering who our NHL partner will be. The Oilers and Thunder clearly are on the same page in this regard and we look forward to achieving both of these objectives with Edmonton during the 2009-10 season." "We're excited to once again partner with a first class organization in the Edmonton Oilers and the opportunity to work with their exceptional front office is an advantage to the Thunder. They continue to show a strong commitment to strengthening prospect development and our on-ice product by being visibly active when it comes to scouting and on-hands teaching with prospects in our farm system. We look forward to continued success in developing future Oilers talent and helping promote a winning culture they can take on their road to the National Hockey League." STOCKTON, Calif. - The Stockton Thunder, proud ECHL affiliate of the National Hockey League's Edmonton Oilers, has acquired 2009 ECHL All-Star left wing Aaron Clarke from the Wheeling Nailers, completing the original Dec. 4, 2009 transaction that had right wing Colin Power acquired by Wheeling from the Thunder for future considerations, Thunder head coach Matt Thomas announced today. Clarke is one of 18 players named to the Thunder 2009-10 season ending roster, announced today, which includes 17 ECHL-contracted players who appeared in a Thunder uniform for the season. Of the 18 players, eight can be issued Qualifying Offers, which must be submitted to the ECHL on July 1. "Aaron is an exciting, point-per-game caliber player that we couldn't pass up on the chance to acquire," said Thunder head coach Matt Thomas. "With players like Oren Eizenman getting a chance to move onto the American Hockey League, we're hoping that possibly, a player like Aaron can come in and use his skill and leadership to help replace those minutes and points." 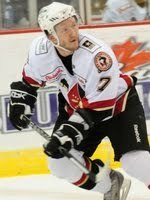 Clarke, 27, comes off a 2009-10 season where he shattered career highs in goals (25), points (57) and assists (32), additionally ranking third on the Nailers in scoring and goals. Contributing on the penalty kill, his five shorthanded goals, a career-high as well, led the ECHL. Completing his third year, the 5-foot-9, 185-pound forward racked up 14 assists on the power-play which ranked tied for second on the team. The Peterborough, Ontario native earned a selection to the American Conference All-Star team in 2009, his first ECHL All-Star berth and scored a goal in the game at Reading. Serving the Nailers as captain, Clarke capped off the year with 37 points (11g-26a) in 40 games for Wheeling and chipped in with three goals and an assist in seven playoff games. Clarke also earned three separate trips to the AHL on professional tryout agreements (PTO) that season, combining for seven points (3g-4a) and six penalty minutes in 32 games with Binghamton, Providence and Albany. In 159 career ECHL games with Wheeling, spanning three seasons (2007-10), he has scored 130 points (55g-75a) and totaled 106 penalty minutes. Previously, Clarke split four years (2003-07) of his college playing career between Niagara University and Robert Morris University (NCAA), suiting up in 95 games while scoring 27 goals, 63 points (27g-36a) and totaling 114 penalty minutes. Clarke joins the Thunder season-ending roster, which under ECHL guidelines may include up to 20 players. Season-ending rosters cannot include any players who did not sign an ECHL contract in 2009-10 (i.e. players who were under contract to teams in either the National Hockey League or the American Hockey League). Each team is entitled to reserve rights to a maximum of eight players from the list of 20 by extending a qualifying offer no later than July 1. Of the eight qualified players, no more than four can be veterans (260 regular season professional hockey games played as of the start of the 2010-11 season). Players on open qualifying offers cannot be traded. Teams are not required to extend a qualifying offer to players who sign a contract prior to July 1. The qualifying offer must remain open for acceptance until Aug. 1 at which time the qualifying offer becomes null and void and the team may sign the qualified player to any salary or may elect to take no further action. Teams that extend a valid qualifying offer to a non-veteran player shall retain the rights to that qualified player for one playing season. A team that extends a valid qualifying offer to a veteran player will retain the rights to that veteran until Aug. 1. After Aug. 1, if the veteran player is not signed to a contract by the team, the veteran shall be deemed a restricted free agent and shall be entitled to seek and secure offers of employment from other ECHL teams. Restricted free agents may not be traded. When a restricted free agent receives a contract offer from a team other than the team with the player's rights and the restricted free agent wishes to accept the contract offer, the restricted free agent and the offering member must, within 24 hours, notify the ECHL, the team with the player's rights and the Professional Hockey Players' Association. The member with the player's rights shall have seven days after the date it is notified to exercise its right to match the contract offer. If a restricted free agent is not signed to either an offer sheet or a contract by an ECHL team by Aug. 31, the player shall be deemed an unrestricted free agent. Qualifying Offers from each individual team are due to the ECHL league office on July 1, 2010. The Thunder are freezing Season Ticket Prices for the 2010-11 season, which are on sale now and can be purchased by calling (209) 373-1500 or by visiting www.stocktonthunder.com. Thunder Season Ticket Holders enjoy the highest-demanded seating locations in Stockton Arena, preferred parking options, benefits including admission to Season Ticket Holder-only events, discount opportunities on Thunder merchandise, a free e-newsletter, an exclusive gift, admission to the first two rounds of the Kelly Cup Playoffs and more. Information on individual tickets and min-plans will be announced soon. 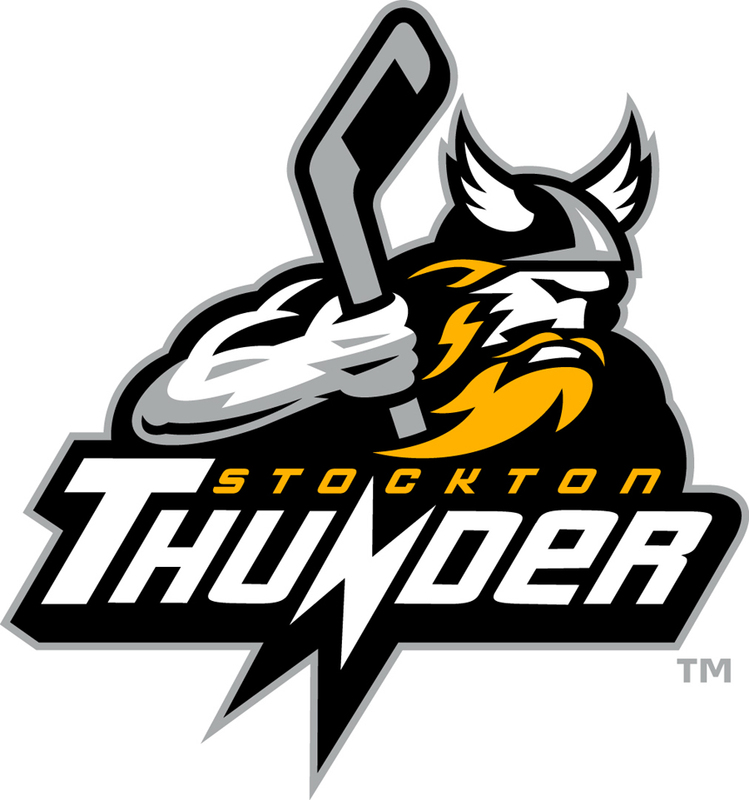 A two-time recipient of the ECHL "Award of Excellence," Thunder was voted "Best Local Sports Team" by readers of the San Joaquin Magazine, led the ECHL in attendance for four consecutive seasons and drew over 200,000 fans for the fifth consecutive season in 2009-10. Season Tickets for 2010-11 are on sale now. For more information about tickets, merchandise, or other inquiries contact the Stockton Thunder offices at (209) 373-1500 or visit http://www.stocktonthunder.com/ . The AHL today announced the Division Alignments for the 2010-11 season. The Oklahoma City Barons will be playing in the Illinois-Texas and Friends Western Division of the Western Conference along with the Texas Stars, Houston Aeros, San Antonio Rampage, Rockford Icehogs, Peoria Rivermen, Milwaukee Admirals, and the Chicago Wolves. The schedule is still to be released with no news on a date yet. If the rumor that Scott over at OFH broke is true, that OKC is trying to have the home opener against Texas, then it will be a great way to start off our division rivalry with the Stars and the other Texas teams. Alignment is set, now we just need the schedule. Oh yeah, and a coach and GM. "iNews880 Sports has confirmed that the Edmonton Oilers have chosen not to renew the contract of their American Hockey League head coach Rob Daum. Daum, formerly the long-time coach of the University of Alberta Golden Bears, spent the last season-and-a-half coaching in the AHL, after spending one season as an assistant coach with the Oilers. The AHL club in Springfield finished last with a record of 25-39-0-16 under Daum last season. No replacement has been named for the Oilers' new AHL affiliate that will be based in Oklahoma City this coming season." So that brings up the questions, who will be coaching the Barons next season, and when will they be named? And, will someone have to report who it is before the Barons officially announce who it is? 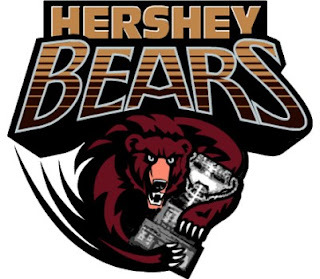 Congratulations to the Hershey Bears for winning the 2009-10 Calder Cup for a 2nd year in a row. Also congrats to the Texas Stars for making it to the finals in their 1st year. STOCKTON, Calif. - The Stockton Thunder, a two-time recipient of the ECHL "Award of Excellence," announced its promotional and giveaway calendar for the 2010-11 regular season with a lineup of popular, familiar and anticipated attractions for the 2010-11 season, the sixth in the San Joaquin Valley. With the Thunder looking to reclaim the lead in ECHL attendance for the fifth time in six seasons the regular season launches on Friday and Saturday, Oct. 15-16 for Opening Night presented by AT&T against the Ontario Reign, starting the first weekend series with two 7:30 p.m. games at Stockton Arena. "Promotional nights are just another piece to the puzzle in providing our fans with a greater experience when coming to see Thunder hockey," said Thunder president Dan Chapman. "We're proud of how the promotional lineup for the 2010-11 season is very diverse and is intended to appeal to fans young and old alike." As a part of "Opening Night," the first 2,000 fans will receive a Thunder schedule poster at the Friday game and the first 1,000 kids (ages 12 and under) will receive a commemorative Thunder t-shirt on Saturday. Returning for the fifth season as the flagship fundraising event, the wildly popular "Thunder Goes Pink" is back as an expanded three-day event on Friday through Sunday, Nov. 5-7 against the Bakersfield Condors. Losing only once in regulation, the Thunder have carried a lifetime 5-1-2 record in the "Thunder Goes Pink" series that turns the games at Stockton Arena into a pink-themed spectacle for local breast cancer awareness and fundraising for the cause. Both Friday and Saturday's games begin at 7:30 p.m. and Sunday's start is at 4:00 p.m. A tradition that headlines the annual event, newly designed special pink-accented jerseys will be worn by the Thunder during all three games and will be available for silent auction to all fans in attendance for the weekend, while a handful of the game-worn jerseys will be available for bidding during live auction immediately following the Saturday, Nov. 6 game. Proceeds will benefit the American Cancer Society - Stockton Field Office and the St. Joseph's Foundation - Breast Cancer Services. Last year, $32,480 in funds raised was split evenly between the event beneficiaries: American Cancer Society - Stockton Field Office and St. Joseph's Foundation - Breast Cancer Services. The Thunder has boosted its all-time, four-year total of funds raised through "Pink" to over $145,000 while over 16,000 fans were in attendance for the two games last year. Free commemorative giveaway items for fans in attendance that weekend will include pink-colored headwear to female fans ages 13 and over in attendance. Additional "Thunder Goes Pink" details and giveaway items will be announced soon. Additionally, the sixth annual "Teddy Bear Toss" is scheduled to return to Stockton Arena on Saturday, Jan. 22 against Ontario at 7:30 p.m. Fans are invited to bring and throw teddy bears or other stuffed animals onto the ice immediately following the Thunder's first goal of the game. Last year's Teddy Bear Toss, played before a sellout crowd of 9,737, netted over 4,348 bears and other stuffed animals to donate to the United Way, who in turn distributed them to local children's charities. It brought the three-year total to over 19,800 animals distributed by the United Way of San Joaquin County to various children's charities, hospitals and police and fire departments throughout Stockton. For fans looking to expand their cold weather items and show their Thunder pride, Thunder fleece blankets will be given away to fans (ages 13 and over) on Saturday, Dec. 11 when the Thunder host the Utah Grizzlies at 7:30 p.m.
Thunder replica jersey giveaways are scheduled for the upcoming season, including two games on Saturdays, Mar. 5 and Mar. 19 (against Alaska and Idaho respectively) where the first 2,000 kids (ages 12 and under) will take home a replica gold "third jersey," just like what the pros wear on the ice. Also new to the giveaway lineup for the budding skateboard enthusiast is an exclusive Thunder skateboard deck, given away to the first 1,000 fans (ages 8-18) in attendance on Saturday, Feb. 5 against the Utah Grizzlies at 7:30 p.m. Replica wood hockey sticks, similar to what the pros use on the ice, will be given away to the first 1,000 kids (ages 12 and under) on both Wednesday and Thursday, Dec. 29-30, when the Thunder host the Las Vegas Wranglers at 7:00 p.m. The third annual Thunder's "Easy Being Green" event is scheduled for Friday and Saturday, March 25-26 at Stockton Arena against the Victoria Salmon Kings at 7:30 p.m. The two-day event, which drew over 13,500 fans last season, featured a pre-game "Green Fair" (before each game) featuring local eco-friendly businesses and organizations distributing information and green-themed giveaways. Headlining the lineup of green-themed giveaways are eco-friendly Thunder "green" bags, free to the first 2,000 fans (ages 18 and over) in attendance, reusable for the home, grocery store, leisure trip, as well as school materials. The Thunder will celebrate "Fan Appreciation Night" on Wednesday, Mar. 30 against the Las Vegas Wranglers at 7:00 p.m. for its final regular season home game. The Thunder, a four-time leader in ECHL attendance, averaged over 6,000 fans per game and drew over 200,000 fans at the gate last season for the fifth straight year. Welcoming its one millionth fan through the turnstiles last season, the Thunder has drawn 14 sellouts in franchise history and had five crowds of 8,000 fans or more in 2009-10. Fri. Nov. 5 Bakersfield 7:30 p.m. "Thunder Goes Pink V"
Sat. Nov. 6 Bakersfield 7:30 p.m. "Thunder Goes Pink V"
Sat. Jan. 22 Ontario 7:30 p.m. "Teddy Bear Toss"
Fri. Mar. 25 Victoria 7:30 p.m. "Thunder's Easy Being Green"
Sat. Mar. 26 Victoria 7:30 p.m. "Thunder's Easy Being Green"
The Stockton Thunder will have a DVD coming out soon portraying the 2009/10 season highlights. Here is the preview for the DVD. It looks great doesn't it? Stay tuned to Oilers Jambalaya and OilFieldHockey.com for more great news on this DVD. "A preview, coming soon to DVD, ThunderVision takes you on a thrill ride of the entire 2009-10 hockey season and Kelly Cup Playoffs - complete with highlights, exclusive interviews, behind-the-scenes footage, and more!" Congratulations to the Chicago Blackhawks on winning the NHL's Stanley Cup. The Hawks were a special team who achieved greatness tonight. Good on them for showing the world that they could do it. They believed it... now so do we. For this moment, you are the best in the world. Congrats! Take notes here Edmonton Oilers. Learn some lessons from these boys. 2010/11, The year of the Oilers? The 1st Season Ticket Holder Advisory Board meeting took place yesterday. And some interesting tidbits came out of the meeting, and were relayed to Oilfieldhockey.com. The one tidbit that was interesting was about who's going to the coach. It was told to one of the board members that a coach won't be announced until after the AHL finals are over. This news comes after a radio interview with Coach Rob Daum on Oilers Lunch on Team 1260. Daum has stated that he wants to coach the Barons, but has yet to speak to Steve Tambellini about the situation.The improvements to the Cox Center, were also talked about in the last nights meeting. That an Open House is planned for sometime in September, after the improvements are completed. Another major delay was a Point of Sale system, especially for the merchandise store. Also it was mentioned that the new ice machine will have it's first test on Aug 15th. Parking was another issue that was discussed at the meeting. Prodigal is working on getting parking available at the Courtyard, and at the Santa Fe Parking Garage. But there was a catch to parking at the Santa Fe Parking Garage. That fee for parking at the Santa Fe garage, would be more then at the Courtyard. Ice Girls dance team was also discussed, but no decision was made to them or not. But from what was told to OFH, that one board member was in favor for a dance team. Prodigal asked the AHL about scheduling the first game here in OKC, to be against the Texas Stars. As this off season trickles by, one has to wonder what is up with the Oilers and the restricted free agents. Has Sam Gagner's agent been talking to Tambellini? What about Gilbert Brule? Did he get an offer yet? What about Andrew Cogliano? Do the Oilers sign him before/if he gets traded? Do both Deslauriers and Dubnyk get a tendered offer? Is only one coming back? Are both coming back? Lot's of questions that need answering. Like I said in the title, the silence is killing me. I would hope that Gagner receives an offer before July 1st as I'm sure at least one other team will throw out an offer sheet for him. I like Gagner too much to lose him because the Oilers didn't try hard enough before it's too late. If another team offers $5 million +, the Oilers will be in tough to sign him to that deal. I should point out that Gagner isn't worth $5+, but another team will do what it takes to get him. He is a key cog for the Oilers moving forward. Vanek, Kessler, Penner and Kessel all were over paid for this reason. Big offer sheets. Let's not have this happen to Gagner. $3.5 million over 5 years is fair and let's move on and get to signing some of the other young players. I would also hope that they can sign both goalies. I personally would take the chance and send JDD down to OKC. It is possible that they could lose him on waivers, but if he clears, that provides one heck of a goalie for the OKC Barons. I would keep Dubnyk with the Oilers and have him backup Khabibulin (and Khabibulin's replacement once he gets hurt.) So if I'm the GM and I'm going to try and send down JDD, he only gets a one year deal with no signing bonus (just in case). I really hope that Marc Pouliot doesn't elect to go to arbitration. I just can't see him making a good enough case to get big dollars. He should just resign to whatever the Oilers offer. He needs to play well this year and make a strong case for himself next year. The KHL held their draft Friday, and there were some players of note that were drafted. John Tavares, Philip Larsen, and Mickael Backlund were also drafted, but those were voided as they currently have NHL contracts. I enjoy stats, so I figured I'd take Behind the Net's Gabriel Desjardins' NHLE on my day off and come up with what we could expect to see next year if they were to play the full season in one league. I highly doubt that will happen, but it gives a good idea. Keep in mind that I just used the regular seasons for these numbers. Math isn't exactly my strong suit, so if I messed up, please call me out on it. Like I said, let me know if I messed something up please. With all the talk about the Edmonton Oilers acquiring Jason Spezza, I tend to sit here and shudder at the thought of Spezza being an Oiler. I don't think he's a great guy to have around for a rebuild and I think he's not the right guy for the Oilers. The only reason I would even want him here... well, watch the video's below. He would be a funny interview. But for hockey reasons (soft), I don't want him. Well who, if any player(s), should the Oilers try and acquire? The only reasonable player in my mind is Nathan Horton. He's a great choice if I'm Steve Tambellini. Horton has put up decent numbers on a mediocre Panthers team and is still young enough so he can be part of the Oilers rebuild for the future. He can play Center or Right Wing and has decent size (which the Oilers need). He's definitely a guy that I would look at trading for, if I was making a trade. From the Oilers Website: General Manager Steve Tambellini announced today the Edmonton Oilers have signed Magnus Paajarvi-Svensson to a three-year NHL entry level contract. 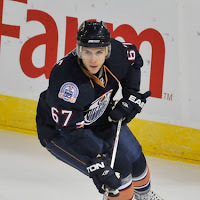 Paajarvi-Svensson, the Oilers 1st round choice, 10th overall, in the 2009 NHL Entry Draft, recently completed his third season with Timra IK of the Swedish Elite League. The 6’2”, 201-pound left-winger from Norrkoping, Sweden, finished third in team scoring with 29 points (12G, 17A) in 49 games. The 19-year-old has also seen considerable action internationally, most recently winning the bronze medal at the 2010 World Championship in Germany with Team Sweden. He led the team in scoring with nine points (5G, 4A) in nine games, was third in tournament scoring and was selected to the tournament all-star team, all at just 19-years-old. Paajarvi-Svensson also has won two silver medals at the 2008 and 2009 IIHF World Junior Championship. In 2008, Paajarvi-Svensson became the youngest player ever to play with Sweden when he was just 16 years and 8 months old. Update:Paajarvi could play in Oklahoma City, if he doesn't make it with the Oilers this season.